Racy tuning car reproduction with aggressive aero parts! Enjoy the breathtaking thrills of AWD performance with special drift tires included! Shaft driven AWD with four-wheel independent suspension in Kyosho’s micro-sized Mini-Z AWD realizes dynamic performance with an advanced new style. The aggressive design of the front spoiler combines with a mock carbon bonnet (decal finish), side steps, and rear under skirt and rear spoiler to recreate the intimidating form of real tricked-out tuning machine. The black and silver 6-spoke wheels add the finishing touch while the included drift tires made from special POM (polyacetal) material produce the drift driving characteristics of the original AWD machine. This kit even includes a guide that teaches you how to master drift driving technique. With the one-piece 2.4GHz RA-19 ESC, receiver unit and servo, finding an open frequency is no longer a problem (transmitter sold separately) so you can concentrate on enjoying the fun of racing.  The car body is finished with Kyosho’s Fine Hand Polish for a hardened vivid surface so you can enjoy the stunning workmanship of this model as it slides around the track, or sits proudly on your desk. Optimal balance is realized through the midship motor mount and shaft drive AWD + 4-wheel independent suspension. Fine Hand Polish finish produces a deep gloss and a hardened surface. Universal swing shafts on all wheels deliver a high efficiency and stable driving characteristics. Uniquely shaped gear teeth on the crown and pinion gears in the precision 3-bevel gear differentials drive all four wheels. Tie rods can be removed with one touch. Front and rear toe angles can also be adjusted with options. Carbon bonnet reproduction delivers the realistic appearance of a real street tuning car.